In Proverbs 22:6, parents are advised to be the source of their child’s values and not to let the child develop his own. Put another way, the focus of the proverb is on whose values the child is to adopt, not whose rules must be obeyed. This verse is often taken to mean that by training our children early such training will be more likely to persist to adulthood. In other words, do not defer training your child. The earlier the better. Unfortunately, while this principle is true enough, this understanding would incorrect. This principle is not what the divine author had in mind. In fact, the verse is a rather sarcastic observation of the consequences of parents letting their children have their own way. So, first let’s get the translation right. In its original Hebrew, the English phrase “in the way he should go” is translated from the Biblical Hebrew phrase, עַל־פִּי דַרְכּוֹ (al-pi darko) – literally “according to his way of the mouth“. Idiomatically al-pi darko means “according to what he says“. In other words, by letting the child have his or her way you run the risk of raising an adult unable to cast away the self-indulgence of youth. Parents who do not heed the wisdom of this text run the great risk of having a thirty-year old son living in the basement playing video games and borrowing your car. 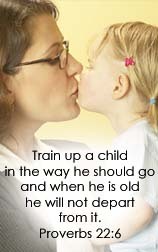 Train a child according to what he says and you’ll produce an adult whose behavior is not easily changed. Phrased this way, the meaning is not so different from the lesson teaches that parents are not to let their children “have their own way“. Such training will produce adults in age only. But, there is a deeper meaning. Parents are to stress the importance of proper values. Teach your children the right values from the beginning and the right behavior will follow. Children have to be taught what values to adopt. Otherwise, they will adopt the values that reflect the way of their mouth. What are these values? We know from other texts that we are to imbue our children with God’s moral values, not our own (Deut 6:7). God reveals to us the specifics of what we are to value (The Ten Commandments, Deut 6:5, Lev 19:18, Lev 19:34, and Matt 7:12 and Matt 22:37). All of these, however, are elegantly summed up in Micah 6:8. Teach these values to your children and humankind will be better off for your effort.